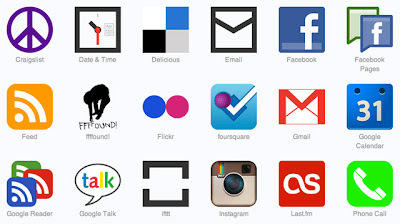 What Is IFTTT And How Will It Effect Our Tasks Online? Blogging and working online can be tiresome with the usual hectic and lengthy processes of completing a particular task. What you desire is a tool that can assist you in your routine online life. This is where the IFTTT comes in. Today, I will acquaint you with what exactly is the IFTTT service and how can you make your online tasks alot easier using IFTTT without any form of complex coding methods or plugins that might make your blog website heavy and slower to open up. Lets begin with the obvious question. IFTTT stands for "if this then that" and is a task based service. You just need to notify what task do you desire to perform, and the IFTTT will perform it for you automatically. It does so by using the Triggers which is the "if" part of the task and Actions which is the "that" portion, as shown in the figure above. .Actions are performed whenever a trigger is set. Here is a common example of the IFTTT service statement. "If I write a new blog post on Word Press, it should automatically be uploaded on my Facebook blog page". A good thing about this service is that it does not require any form of coding method or plugins. It makes the work of scheduling your work and linking activities of two different channels very easy and comprehensive. Channels are the building blocks of IFTTT. It works with channels including social media sites, weather events, stock prices etc. Below is a list of some channels. Full list of IFTTT channels can be viewed here. There are hundreds, even thousands of other combinations you can try, from organizing your photos, sending emails, sorting out to-do lists, you just need to play around and find what works for you. A great thing about IFTTT is that it lets the average folks play around as if they are skilled developers. All you need to do is go to IFTTT website and signup for an account. You will not need to download any softwares or plugins, as you can use Recipes available on their websites. BloggingeHow | Making Blogging Simpler: What Is IFTTT And How Will It Effect Our Tasks Online?